Most small European towns connected to a district heating network have enough land available for a solar field to meet 20 % of heat demand. 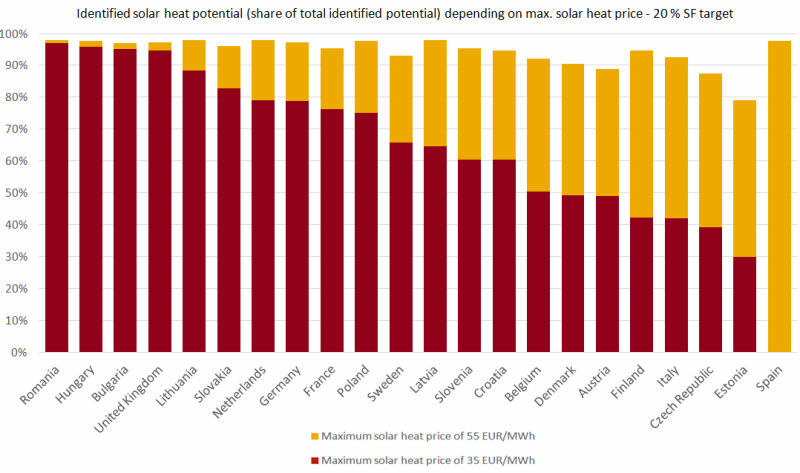 In all, 93 % of the identified solar heat potential can be produced at a price of less than 50 EUR/MWh. These are the key findings from a study by PlanEnergi, a Danish consultancy. Its authors analysed maps showing 2,480 district heating networks in 22 countries that have no means of using waste heat for the task. 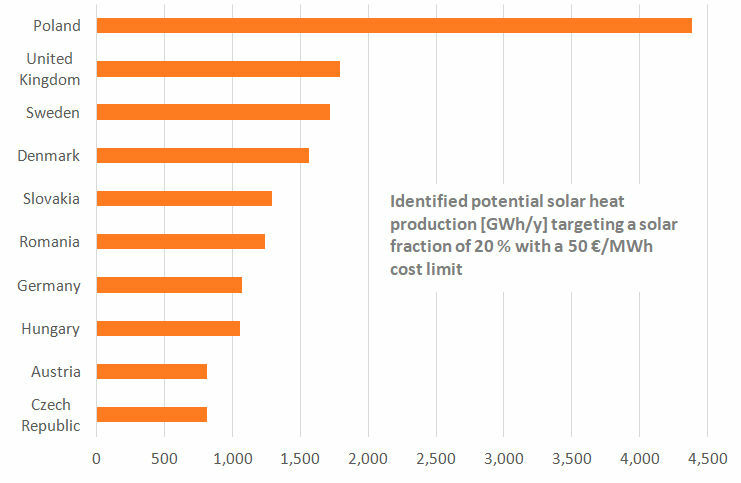 The chart shows the 10 which have the greatest potential for solar district heating at less than 50 EUR/MWh. PlanEnergi explained the methodology and summarised the results in a report titled Solar District Heating Trends and Possibilities. It has been published by research platform Solar Heat and Energy Economics in Urban Environments under the auspices of the IEA Solar Heating and Cooling Programme. “We’ve seen strong growth in solar district heating in Denmark over the past decade, so we wanted to find out whether other countries could see similar levels of progress,” Daniel Trier, who works at PlanEnergi, explained. There are 104 Danish towns which have a large-scale solar thermal plant to supply them with heat. The smallest has a population of 256 and the biggest 43,885, at an average of 4,169. In addition to land being more easily available around villages, the authors observed average heat prices to be much higher than in cities, as thermal energy was generated at greater cost, for example, via gas-fired CHP or boiler units. Technical solar-related potential of existing district heating networks in smaller European towns where waste heat is not used but solar heat meets 20 % of yearly district heating demand. PlanEnergi’s analysis has been conducted in partnership with Heat Roadmap Europe, a project which aims to establish new policies and encourage investment in methods which can decarbonise heating and cooling. Using a geographical information system (GIS), the authors of the study set maps of resources and district heating networks across Europe in relation to available heat sources, such as excess thermal energy, and heat demand. 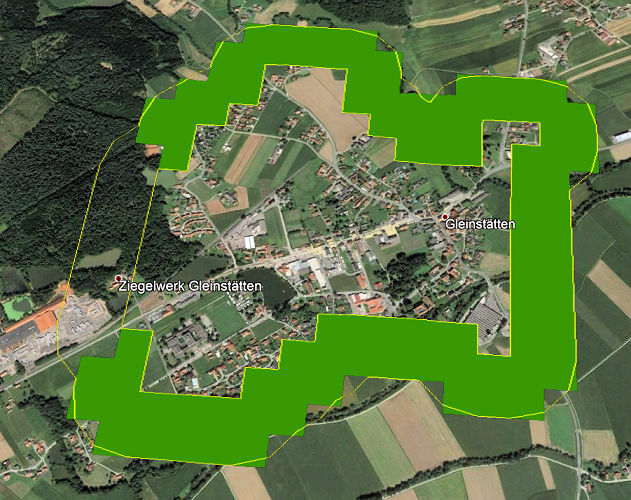 The green colour in this photo of Gleinstätten, Austria, indicates potential areas for SDH installations across a 200-metre zone starting at the town’s borders. Land used for agriculture, as well as some undeveloped areas such as grassland, was assumed to be suitable. The authors identified 20 TWh of solar heat potential in regard to district heating plants in operation throughout Europe. As shown in the table above, it would require 48 million m2 of collector area to exploit it. Obviously, this is the low-hanging fruit, as the figure refers to existing networks in small towns where waste heat is not used. It represents only a small fraction of the entire technical potential of solar district heating in Europe. However, what the analysis does not reveal is whether the land in question can be purchased or leased at all. Subsequently, it was determined what solar heat prices could be achieved for around 2,500 potential solar district heating plants (see chart below). The investment comprised the solar field, including installation, energy storage, transmission and land. Solar technology was assumed to be offered at the same price in all countries, whereas the cost of land was determined for each country individually. Proportion of technical potential (see the table above) at a maximum of EUR 35 or EUR 55 for each MWh. Parameters of analysis: loan at 3 % interest per year, 25-year economic life of solar field and 20-year span regarding storage tank, as well as 3 kWhel of solar electricity per MWh for pumping.